Sunglasses are handy little devices. Not only can they protect your pupils from melting, but if you ride a motorcycle they can also keep your peepers safe from flying rocks and bugs. Considering most people enjoy the ability to see, you would think spending a little extra dough on some quality glasses wouldn't be a problem. Well no matter how much you like your eyes, not everybody's made out of money, right? 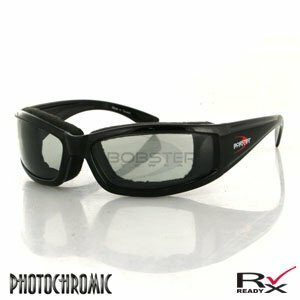 Bobster Eyewear recognizes we don't all have money to blow and has designed its Invader Sunglasses to be feature-rich and stylish without costing an arm and a leg. These specs are a bit beefier than average sunglasses with fleece-lined open cell frame foam. That means they sit more flush against your face like a goggle. It does help keep out debris and wind, though. The lenses are also shatter-resistant and provide 100% UVA/UVB protection to keep those pupils from melting like we talked about. One of the higher-end features on these glasses is the transition lenses. In low light conditions the lens is clear, and in direct sunlight they automatically tint themselves. It's a handy feature, but sunglasses with clear lenses sometimes tend to have an awkward look to them. The price of these glasses is also one of their best features. They really do offer a lot of options for a relatively cheap price. If you dig the way they look, check them out.